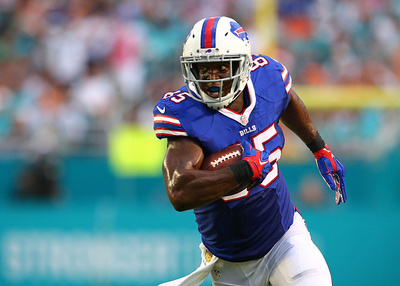 - Now a mainstay of the Bills roster, Charles Clay has gotten through the egregious years of his contract and now is in the realm where his deal starts to make a bit more sense. Over the course of his three seasons in Buffalo, he hasn’t been a game breaker by any means, but he also hasn’t played in a particularly prolific passing attack, either. Clay has done well to work with the targets he has received and seemed poised for a substantial role in 2017 before injuring his knee early into the season in Cincinnati. Nearing the age of 30 the possibility exists over the next year or two that Clay could see a drop-off in part of what gives him an edge — his athleticism, and his rather long injury list could have something to do with that, too. - At some point in the 2018 season, you’d have to believe that the Bills will give the first-round quarterback Josh Allen an opportunity to learn on the job. When that happens, the potential for Clay’s season upgrades dramatically. Allen is a quarterback that will take more chances to get the ball to his targets, and with how often we’ve seen Clay working well over the middle of the defense, that could stand to be a solid combination whenever the two players are on the field. And with no real push from a young backup at tight end, Clay will continue with the starting role in 2018 barring any injuries.